No seriously. it's Lacquer Legion day and my nails are stupid short. I broke one reeeeal bad and filed the rest to match. Whomp whomppp. The theme for today's Lacquer Legion prompt is After Dark! Anything spooky scary goes. And I was seriously tempted to try Werewolf Bar Mitzvah... But it's a little late in the evening to paint a werewolf in a yarmulke. Boys becoming men, men becoming wolves... If you haven't watched 30 Rock you can just show yourself out of that joke. Pretty much every Halloween nail art idea ever has already been done, so I went for something a little more abstract versus like, a pumpkin or a skull. My pal Tiffany from Nail Polish Canada sent me over a Halloween plate to play with so I used that to create something cute! It's like halloweeny newspaper blood splatter patterned goodness! I gotta say I really like how they look. It almost looks like a nail strip type design. The words everywhere look cool, even though my tiny nails don't allow for many entire words on there, and I love the blood peeking through! I started with a base of one of my go-to whites, Color Club - French Tip. I used red acrylic paint and a small brush for the splatters, I kinda just blobbed and smeared it on there. Very simple, no need to be precise. The stamp is from Bundle Monster's holiday collection - plate BM-H07, and I used Konad black polish to stamp it. I ended up not using any topcoat on these because I like the mixture of the finishes with the polish, paint, and stamping. What do you guys think of these nails? 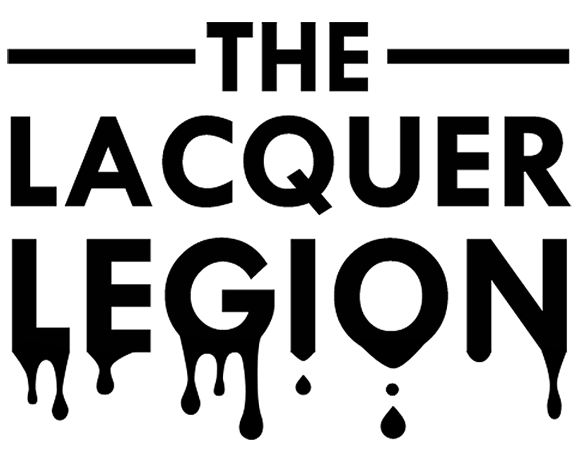 Don't forget to share your Lacquer Legion manis all around the web with the hashtag #LLAfterDark. I realized recently that I never got around to posting swatches of the last few sets of Shimmer Polish that I have, because like I have said, I am the worst. But never fear, they are coming. Just as soon as my badly broken nail grows out a little. In the meantime, I had three done already for your viewing pleasure today! And I am generally very weary of indie polishes for quality reasons, but I stand behind these because even now, over 2 years after I got them, they are still perfect. Alessandra is a Christmasy mix of red, green and silver glitters of all shapes and sizes. Shown is one coat of glitter over the base color! I'll be breaking this baby out for the holiday season for sure! Omgomg look at that teeeeeal. So pretty right? And the little mix of red glitter in there really makes it different and gives it depth. I believe I did 2 coats of this one to get as much glittery goodness on there as I could. I love all the tiny lil' squares. I could stare at it for hours. Hi there! Today I'm gonna be posting a polish I meant to post about a long time ago but you know me, I get distracted. Actually I have a funny story about this polish. You may know that when I go on vacation somewhere, I am pretty uncontrollable with my spending when it comes to stuff I can't get locally, such as Deborah Lippmann polishes. Last year, I went to St. Louis, and I bought two DL's at Nordstrom. Last year, I also went to Chicago, and I bought two DL's at Sephora. Only problem is... I bought this one both times. I had no recollection of buying it before, I'm usually really good at knowing what I have and don't have. But at some point I noticed that it was there twice on my polish stash spreadsheet which got me thinking, OMG I totally did buy that twice. A major DOH moment. So I went to check my Lippmann's on my nice little shelf, and there is only one bottle of it there. So I said no, maybe it was an accident that I put it there twice on the list. So I check out my haul posts for the months I had both of those trips, and SURE ENOUGH, I have it in both of them. So I bought it twice. I definitely did. But I still cant find the second bottle?! Did I notice the mistake once before and give it as a gift or something and totally just let it all slip from my mind? I DUNNO. Anyway. Here's Just Dance from Deborah Lippmann. A polish so nice you might buy it twice. I can't remember now if this is two or three coats, but I do know that there is no base color, just lovely full coverage glitter. Blue glitters are one of my favorite polishes to wear, and this one applies sooooo great. I'm actually thinking of going and putting it on again right after I finish this post. Such blue. Many Glitter. Wow. The moral of this story is that we all need to settle down and not wind up buying two of the same pricey polish. Unless you mean to. Like maybe you like it sooooo much you need two. Because you never know when you might run out. Just in case. Right? RIGHT? This post is quite delayed thanks to my post-31DC2014 burnout. Oh boy, it's been nice not to be slaving away at nails every day! And it's so great to do a manicure you love and not have to take it off soon after. I ended up being kiiiiinda bad this month though, buying-wise. Winners killed me. Tooootally. In one night I had my biggest polish haul in a long time. First up was this Deborah Lippmann set called Starlight. It was one of those things that you don't even have to think about, it just goes into your cart. And actually, my dad bought it for me as a late birthday gift because he said he understood that Lippmanns are "important." He's well trained. And besides that, I bought two Zoya's on clearance for $2 and one Essence at the drugstore. To curb my badness I also gave away 11 bottles to a friend. Redeemed. It's time to recap all the nails from this year's challenge! I gotta say, I am really proud of most of the work I did this time around! There were a few duds, but there always are. Haha! Head after the jump for the photos, and click on any design to be taken to that specific post. Today is the final day for the 31 Day Challenge! OMG, I am always so happy when today rolls around. I get super excited to do a nice manicure and leave it on for an entire week. Actually, I think I'll leave this manicure on for an entire week. The final theme is one of my favorites - Honor Nails You Love! Usually by the end of the challenge, my fellow challenge participant and bestie Sarah of Chalkboard Nails will do something so amazing I feel the need to instantly put it on my nails. Cue her dripping chevron manicure. I didn't get to do it instantly, but I did get to do it today! Tada! UGH I'm so in love with these. Totally patting myself on the back for the effort I put into these to finish the challenge strong. Also do you like my strategically placed ring to cover my worsening booboo? I switched up the colors from Sarah's original look to make it more me. Basically I can't stop using these colors so therefore can't stop won't stop the sunsational manis. I did a coat of Seche Vite first and then added a coat of Butter London's matte topcoat which I found today of course after using a failure of a matte topcoat yesterday. Sarah adores matte everything and I think I might be a convert now also. Thank you so much to those of you who have been following me along this journey once again! And congrats to those of you who've completed it as well. Stay tuned tomorrow for the round up post where me and blogger will have our annual fight about photo alignment and then call it a day on the challenge for another year.